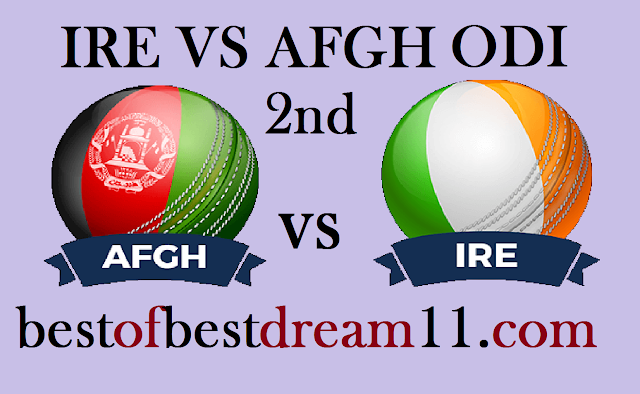 Here is best "AFGHANISTAN VS IRELAND" 2ND ODI match, Dream11 Predictions for the Fantasy user ,who venue are looking to make a strong team for maximum win. We are providing latest news, match update, information about the match .The team is picked by using various factors on the basis of performance, ground stats and latest form. By winning the first match of the three-match ODI series, Afghanistan's team has made an edge 1-0 in the series.This match will be very important for both teams, because if the Afghanistan team wins, then they will win the series too.After losing the T20 series to Ireland on their home ground, it is also facing the danger of losing in one-day series. The pitch was on the slower side in the first ODI, The track is expected to assist the bowlers. 1- For AFGH, Gulbadin Naib(64) and Hashmatullah Shahidi(54) played a good innings and gave a good score to their team in the first odi. 2-Rahmat Shah(29) and skipper Ashgar Afghan(25) helped the team quite well. 3- in bowling,Rashid Khan(2-41),Mujeeb Ur Rahman(1-32) and Mo Nabi(2-42) bowled very well in the last match. 4-For IRE, Andrew Balbirine(55) and Gary Wilson(38) batted very well and struggled with the afghan bowlers. 5-Paul Stirling has failed to give a good start to the team so far. 6- in bowling,Tim Murtagh(4-31) and Boyd Rankin(3-44) will be crucial with the bowl. Mohd Shahzad is expected to make his way back to the team after a one match ban for violation of the ACB code of conduct. For Ireland, the bowlers did a good job ,but the slowness of the track might tempt them to bring in George Dockrell.